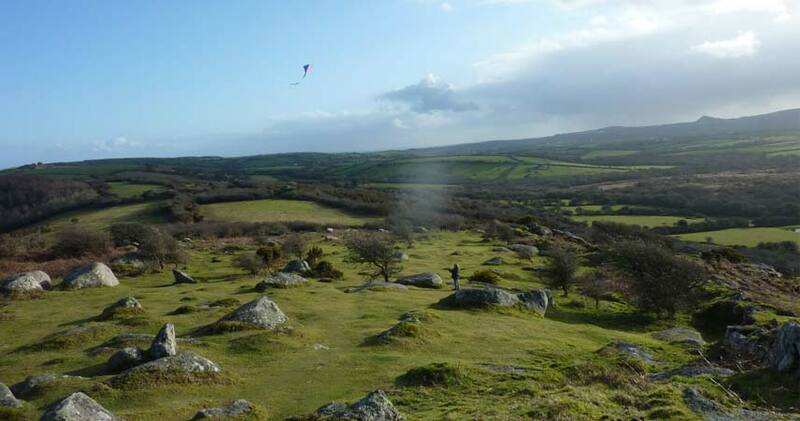 One of the best places for flying kites near Bosinver is Helman Tor Nature Reserve, which is where is Nanny Pat took Wilfred and Megan recently. There’s plenty of space to explore and rocks to climb (ideal for active kids), so it’s a great area to visit at any time of the year. Helman Tor Nature Reserve is Cornwall Wildlife Trust’s largest nature reserve with 536 acres in total. As the reserve has so many different types of habitat – including wet and dry heathland, wetland, acid grassland, willow and oak woodland – numerous species of butterflies, dragonflies, birds, mammals and reptiles all thrive here – (although on a rather blustery early spring day Nanny Pat and the children didn’t see much wildlife this time). If you enjoy walking, download the Wilderness Trail leaflet from Cornwall Wildlife Trust which has details of walking routes on Helman Tor. The full trail is 8 miles long, but there’s also a shorter 2.5 mile trail which is great for families with younger children or when you’ve only got a limited amount of time. Getting there: Helman Tor is 2.5 miles south of Bodmin. Full directions can be found on Cornwall Wildlife Trust’s website. There’s a limited amount of car parking at the reserve. PS: If you’re coming down to Bosinver, you can borrow kites like the ones Wilf and Megan flew from reception. They’re easy to fly, even for young children and don’t take up much room in the car! This post has been linked to the Outdoor Play Party hosted by Abbie at the fabulous Greening Sam and Avery. For more stories and inspiration on getting your own children outdoors and playing, visit the Outdoor Play Party every week via any of the hosting blogs which includes Abbie’s, together with Mama Pea Pod, Learning for Life and The Golden Gleam, all of which are must-read parenting blogs.